Mystery Inc. heads to Blowout Beach for a real swinging party, but when the Ghost Pirates threaten to harsh the good vibes, it's up to the Scooby Gang to get the party back on track and save the day! For a new animated adventure, we head to 2017�s Lego Scooby-Doo: Blowout Beach Bash. The titular party promises three days of fun, frolic and food. However, matters don�t go down as hoped, so the crew from Mystery Inc. � Fred Jones (voiced by Frank Welker), Velma Dinkley (Kate Micucci), Daphne Blake (Grey Griffin) and Scooby-Doo (Welker) � need to hop into action. A crew of ghost pirates reaches the beach and creates havoc Mystery Inc. must address. My last experience with �direct-to-video� Scooby-Doo came from 2015�s Rock and Roll Mystery, a pairing with the band Kiss that worked surprisingly well. Since I�ve also enjoyed recent Lego efforts like Lego Star Wars: The Freemaker Adventures, I hoped Bash would optimize both properties. Alas, Bash never manages to offer more than minor amusement. Perhaps this occurs because both Lego and Scooby-Doo tend toward self-aware mirth and just don�t mesh well. Ever since the the 2002 big-screen film, the Scooby-Doo franchise has preferred winking self-parody, and Lego adaptations tend along those lines too, as they tend to poke fun at their sources. The decision to spoof something that already acts as a spoof �cancels out� the strengths of both franchises to some degree and makes Bash feel less than inspired. It doesn�t help that Bash fails to explore an especially concise plot. Though my synopsis implies a particular �Point A to Point B� narrative, the movie branches off into a bunch of different threads, and these mean it lacks much cohesion. Granted, no one expects tight storytelling from a comedic Scooby-Doo adventure, but Bash just meanders a little too much. Without a more dynamic through-line, the end result feels scattered. Bash does throw enough at the wall that some of it sticks, so a few laughs pop up along the way. It also comes with a nice cast, as the actors fill out their roles well. A few positives aside, Bash can�t quite kick into high gear. While it offers mild amusement, it seems pretty forgettable overall. Lego Scooby-Doo: Blowout Beach Bash appears in an aspect ratio of approximately 1.78:1 on this Blu-ray Disc. No problems marred this excellent presentation. Sharpness seemed positive, as at all times, the movie remained detailed and concise. No examples of softness or ill-defined images appeared in this tight and firm presentation. Jagged edges and moir� effects appeared absent, and I noticed no signs of edge enhancement. In regard to print flaws, I witnessed none, as the movie looked clean and fresh from start to finish. Colors varied, with some emphasis on reds, yellows and oranges. Toss in some teal and this turned into a vivid palette with lively hues. Black levels looked solid, with appropriately dark and rich material. Low-light images were concisely displayed and tight, with no excessive opacity. Overall, Bash gave us a stellar presentation. Though acceptable, the movie�s DTS-HD MA 5.1 soundtrack lacked much pizzazz. The soundscape tended to favor music and general ambience, so only a few sequences broadened the spectrum. Those scenes threw out a bit of involvement but they occurred too infrequently to turn this into a memorable soundfield. Audio quality worked fine. Music was peppy and full, while effects � as low-key as they tended to be � seemed accurate and clear. Dialogue always appeared natural and concise. This turned into a decent but unexceptional mix. The disc includes three bonus cartoons. We find �Go Away Ghost Ship� (22:09), �A Clue For Scooby-Doo� (22:06) and �Party Like It�s 1899� (22:14). �Ship� and �Clue� both come from the original 1969 Scooby-Doo, Where Are You series, while �1899� stems from 2015�s Be Cool, Scooby-Doo. The two 1960s shows offer some charm, and �1899� offers a little humor as well � along with the same cast as Bash. These programs add some value to the package. Trailers presents ads for the Lego City Undercover game, Lego Batman Movie, The Jetsons & WWE: Robo-Wrestlemania, and Max 2. A second disc provides a DVD copy of Bash. It includes the same extras as the Blu-ray. 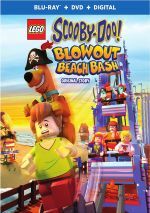 Two franchises combine via Lego Scooby-Doo: Blowout Beach Bash - with mediocre results. Despite a few bits of amusement, the movie fails to turn into anything especially clever or delightful. The Blu-ray boasts excellent visuals along with acceptable audio and some bonus cartoons. Bash turns into spotty entertainment.